"Very nice apartment in the center of the resort. Many rooms and bathrooms, ideal for a family or friends. Rachel is always available to accommodate her guests" (Rebecca, Aug 2017, Airbnb). We have two apartments in this handsome 200-year old building, which was once a hotel, and was sympathetically converted into 8 apartments of a luxury standard in 2004. 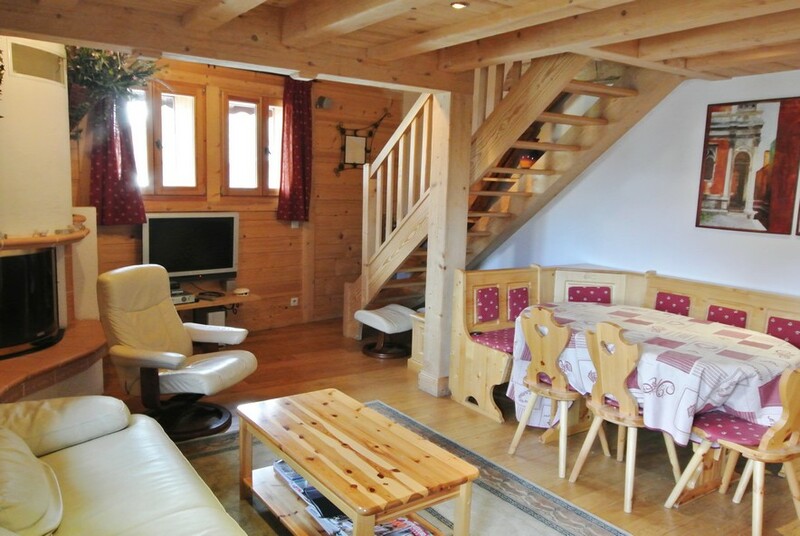 Apartment H is an excellent choice of apartment for 4 couples or 2 small families. It is a spacious 4-bedroomed penthouse apartment on 2 floors, comprising 105 m². Each apartment has a parking space and a secure ski & boot locker at ground level, and a lift takes you up to the entrance of apartment H at 2nd floor level. There is an open-plan lounge / dining room featuring a curved built-in fireplace with a sliding glass front, and cream leather furniture in which to relax and unwind after a hard day on the mountain! The streamlined kitchen area has excellent facilities and lovely dark granite work surfaces. Beautifully finished and decorated, the apartment is supplied with pure white cotton bedlinen and matching towels. The Master bedroom has a king size bed, plasma screen TV / DVD with its own Freesat decoder, ensuite bathroom with bath, overhead shower and WC. Bedroom 2 is a double with an exterior shower room and WC. A flight of stairs integrated into the beams above the dining table leads up to the top floor, which is built into the eaves of the building and features all original beams and wood. Bedroom 3 is very spacious and has 2 single beds, and a full-size fold-down single bed (if required), and an ensuite shower and WC. Bedroom 4, the smallest of the bedrooms, has a double bed, and ensuite shower and WC. All bathrooms have heated towel rails, and both floors have underfloor heating. PLEASE NOTE: The Residence des Alpes does not have secure storage for mountain (or road) bikes, therefore we are regretfully not able to take bookings for groups with bikes. We are part of the superb Multipass offer, which means that our guests are able to use some leisure facilities in the whole of the Portes du Soleil for just €2 per person per day including the Morzine indoor and outdoor swimming pool complex.